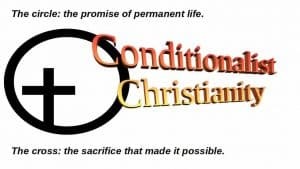 In this article, Jefferson Vann defines Conditionalist Christianity as a testimony of hope in God’s promise of a future permanent life. He then outlines the discipline of formulating a systematic theology, and defines some key terms which will be used throughout the series. Conditionalist Christianity is a testimony of hope in God’s promise of a future permanent life. But it is also a lifestyle that lives up to that testimony. The apostles in the New Testament modelled that lifestyle and encouraged their readers to follow their examples. They believed that people could be won to Christ because of the sheer attraction of a righteous life lived in the backdrop of a sinful world. But these same apostles insisted that to reflect true Christianity, their readers had to do more than just “walk the walk.” They also had to “talk the talk.” They had to know what they believed and be able to communicate that faith to the watching (and listening) world. Since the Christian world-view is based on the unchanging truth of the Bible and backed up by real experiences, the doctrines that proceed from that world-view should be explainable and defensible. The true Christian should know what she believes, why she believes it, and why she does not believe the opposite. She should never hide behind ignorance pretending to be toleration. This is when she might have sincere convictions, but is hesitant to challenge others who disagree with her, because she fears she might not be able to prove her case. A Christianity who values tolerance above truth is like a rescue worker who throws out a life preserver but then fails to hold firmly to it. Those who are drowning and need assistance will (of course) grab on to the chance for life. But as they continue floating out to sea, they realize that the assistance was only a pretense. We are living in such a generation. We should not be surprised when the lost decide to try some other solution rather than grasp our ungrounded traditions. The problem is not with Christianity itself but in a weak grasp of it. The purpose of this series of articles is to help today’s Conditionalist Christians get a firm grip on the faith they profess. A Christian should not only be able to affirm the statement of faith of his church, but he should also be able to explain it.3 If someone opposes her, she should feel confident enough in her position to engage in healthy debate. This confidence should come from her familiarity with the issues of the debate, not from debating skills or dominant personality. One of the tools which have helped Christians of past generations keep their grip on their faith is systematic theology. Systematic theology is the discipline that formulates comprehensive answers to the questions we all have about God and those ultimate issues that he (and the rest of the universe) cares about.4 It comes with its own language: a set of categories and terms which help systematic theologians compare each others’ ideas. The categories and terms serve as a grid to help us evaluate the accuracy of our individual answers. The primary categories used in these articles are often called the loci of systematic theology. Each locus serves as a heading under which several major questions are posited and then answered. The following chart represents how those loci will serve as the kind of scaffolding upon which this book will be built. Prolegomena This category answers questions about the task of systematic theology itself, other kinds of theology, and the ground rules for doing systematic theology. Bibliology This category answers questions about how God has revealed himself, especially about the nature of his written revelation: the Bible. Theology Proper This category answers questions about who (or what) God is, what he is like, and how he compares to the rest of the universe. Anthropology This category answers questions about who humanity is, the things that unify us (like our nature and destiny) and the things that make us unique (like race, gender, social and economic status). Christology This category answers questions about who Jesus Christ is, what he taught, and the relationship he has to believers and unbelievers. Pneumatology This category answers questions about who and what the Holy Spirit is, what he does, and how the world and the Church are affected by his presence. >Angelology This category answers questions about the other spirit beings who populate the universe, including Satan and the demons, as well as the elect angels who have remained loyal to God. Soteriology This category answers questions about what God has done to rid the universe of the sin problem, and what he is doing now in the lives of believers to get them ready for the sinless universe he plans. Ecclesiology This category answers questions about who and what the Church is, how the Church differs from the world, and our role within it. Eschatology This category answers questions about our destiny as believers, the return of Christ, and the ultimate fate of the lost. The apostles encouraged their readers to have an answer available when questioned about their faith. Today believers have the same need: to be able to explain their faith in terms that match the questions people ask of them. In Peter’s day, some of those questions came from government or religious officials who attacked and persecuted Christians. We may experience those kinds of questions as well.5 But our hope is that most of the questions come from people who are interested in our faith because they are interested in us. Either way, the questions should not be ignored. They are our opportunities to testify to our relationship with Christ through faith. One way to form adequate responses to the world’s questions is to compare our answers to those of other believers. This is one of the major reasons for systematic theology as a discipline. By studying the theological systems of others, I can ensure that my own system is not lacking any vital component and that it is both biblically accurate and experientially relevant. The industrial pragmatist agrees, not because theology is primitive, but because he sees it as a distraction from what really matters in life (which can be anything from self-actualization to cold hard cash). Curiously enough, some of the most ardent attacks against systematic theology come from Bible-believing, church-going evangelicals. Some churches have been hesitant to hire trained pastors, fearing that a study of systematic theology at college and seminary would ruin them, making them incapable of just teaching the plain truth from the Bible. These same people would never dare go “under the knife,” allowing an untrained surgeon to operate on them, yet they think that professional training of any sort is harmful to the preacher. They have more in common with the religious mystic than they would care to admit. There is some truth in each one of these objections to the task of systematic theology. Some of the doctrines we have defended through the centuries are the products of human prejudice and tradition, rather than divine revelation.8 A good systematic theology has to dig deeply into the theological assertions of the past to make sure that their source is God’s word. Conditionalists are used to that kind of study, having to battle traditions about human nature and destiny at every turn. Often the Church has been satisfied with its profession simply because it protected the status quo. We owe Darwin, Marx and Stalin and the like an apology for giving them good reasons to side against us. It is not that evolutionary atheism is right – but the traditional Church was not entirely right either. The last thing systematic theology should do is keep us from living life, and in that regard the industrial pragmatist is right. But living life consists of so much more than getting on top or dying with the most money. The religious mystic is not concerned with explaining things. He just wants a relationship with the spirit world that works – that gets the job done. In that respect, he also is a pragmatist. His beef with systematic theologians is that we are always trying to explain what everybody knows is a mystery. If God were knowable, he would not be God. Systematic theologians often present a God who can be contained within the confines of a creed, or a doctrine. To the religious mystic, that is ridiculous. They are partly right. Most of our definitions of God are nowhere near accurate.10 Yet since God has revealed himself and given us the capacity to explain what we experience, it is not impossible to explain that experience. In fact, it is the only way for us to compare the various experiences that human beings have had, and claimed to be divine. Last at bat is the Bible-believing evangelical Christian who is hesitant to listen to a professionally trained pastor. Perhaps he thinks the Holy Spirit refuses to work through a preacher who picks up a book now and then. Maybe he feels it is safer for his teacher to just open the Bible, point his finger at a passage, and then let the Spirit take over. He does not need to be confused by anyone else’s views on the good book. He should just let God work through him. A text is a passage of scripture that will be referred to as a means of making or supporting an argument. Some texts will be considered normative, which means that those texts are the ones anyone should use to prove his point as it relates to the question at hand. For example, John 10:10 is a normative text for Christology since it describes Christ’s role as the Good Shepherd. It is not, however, a normative text for Angelology, since it cannot be proven from the context that Jesus was referring to Satan. The context is the larger passage, and the background of the text, each of which helps the reader understand the purpose of the text originally. In these articles, every doctrine is related to a higher category, or locus. As previously mentioned, the loci serve as headings under which several major questions are posited, and then answered. The overall theme of this series of articles is that of Conditionalist Christianity. Conditionalist Christianity is a testimony of hope in God’s promise of a future permanent life. A Conditionalist Christian defines the gospel message as the revelation of that promise. A Conditionalist Christian sees the Bible in its entirety as the explanation of that hope. The next article in this series will show how the Bible does that. It will be a summarised biblical theology.